"The Goddess in Every Woman"
We, my sisters, are the daughters of Eve. 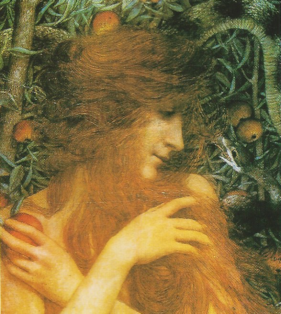 She who ate the forbidden fruit from the Garden of Eden. She who ignited fear in the eyes of the religious patriarchy. She who gave birth to the feminine and brought forth woman to be the mother, daughter, sister, aunt, consort, wife, and grandmother for this earthly realm. From within her womb sprang forth all of human creation to dance the gift of life. Through this dance, the Divine Feminine emerged in the form of Goddesses. Their origins derive from ancient cultures, history, myths and legends to teach us the mysteries of womankind. The Goddess comes to us as Aphrodite, Persephone, Demeter, Sophia, Hera, Diana, Isis, Hecate, Kali, Inanna.... The Goddess in her many forms and names calls forth the Goddess in all woman to Rise and become the best that we can be. The archetypal feminine of the Ancient Goddesses resounds in the characteristic qualities, behaviors, patterns and actions in all women who have dwelt upon this earth since the beginning of time. If you look closely you can see her face shinning out, from the young girl to the old crone.... she is there imparting her wisdom and expressing the power she possesses. We have but only to look inside ourselves to recognize her presence. I invite you to join me in the exploration of these Goddesses in my Blog. Together we will journey through time into the orgins from which they birthed, and discover how their influence has touched us. We will learn from their individual personas the wisdom, grace and power they possess. From this we will discover the important roles they have played in our lives, how to invoke their strength to assist us in the process of our growth and discover the Goddess that dwells within us all.